Social media is the great example of Pareto principal at work (roughly 80% of the effects come from 20% of the causes). My best advice is not to spread yourself too thin. Find the one social media platform that YOUR target audience seems to favor and stick with it. Learn the ins and outs of it. Master all the nuances of social media traffic generation from that platform. Figure out how to put most of it on autopilot. 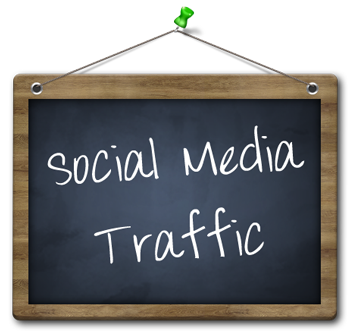 If you are already driving social media traffic large enough to analyze some stats, then start here. Go to your GA dashboard and look up your referral traffic. See which social media platform drives the most traffic AND converts the best. If you are brand new to social media or even blogging in general, then see where your competitors get most of their traffic from. That should be a good indicator of which social media your potential readers might be hanging out. The easiest way of collecting this type of data is through Alexa.com. Just search for any competitor’s site and go under “Clickstream” to see where their social media traffic comes from. While there are scads of social media traffic sources, I have outlined some of the big dogs for you. Slideshare is my new personal favorite platform when it comes down to social media traffic generation. Image Gone Viral or Ana Gone Mad? Loved what you’ve seen at Traffic Generation Café so far? Then you are going to love my free Bite-Size Traffic Hacks email series – concise, actionable traffic generating hacks you can implement today and start seeing almost immediate traffic increase. Plus, you’ll get my super-awesome value-packed “Mommy, Where Does My Traffic Come From?” traffic report for the rock-bottom price of FREE. Just add your email to the form below and click “Yes, Send Me My Traffic Hacks“. See you on the “in” side and have fun storming social media traffic!